The Border Collie Spot is, as its name suggests, a border collie-specific rescue centre. During the course of more than 20 years, Gill White has saved hundreds of unwanted farm dogs from a life of neglect and, often, cruelty. Today Gill’s network reaches right across the UK, and Ireland too. No matter their size, shape, colour, condition, or how damaged they are, Gill endeavours to find homes for all the fortunate collies that find themselves at The Spot. Those that cannot be homed stay with her at the rescue in Binfield, near Wokingham, Berkshire. As you can imagine, the costs of running The Spot are astronomical, especially as many of the dogs require specialist veterinary treatment – and they all need a good grooming! 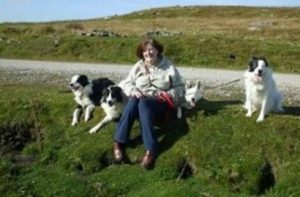 These expenses are met by Gill herself, from her pension, and so she relies on the kindness and generosity of the public for funding, as well as a small team of volunteers who help with finding homes for the dogs and with fundraising. If you would like to help Gill continue her amazing work, taking care of all these poor dogs, then please do consider making a regular donation by clicking the Donate button on the home page.